Honda 6500 Watt generator – Over the last 15 years, the amount of reported power outages across the country has risen significantly. Many of the outages are the result of an increase in extreme weather. Yet, power outages can happen at any time for any reason. Having a Honda Generator EM65oo is helpful. Even mild storms can knock power out. Sometimes there are random outages as a result of downed lines or utility work. There is rarely a warning that you will have an outage. Having a backup generator can make a difference in quality of life during a power outage. A generator gives you the ability to still run certain appliances and makes for a safer and calmer experience. 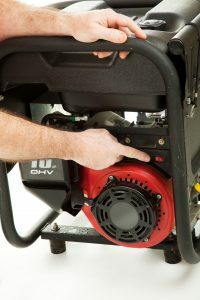 There are many generators available on the market, but the features of the Honda 6500 Watt Generator make it stand out. We’ve reviewed it so you can learn everything you need to know about this generator and see why it’s a smart purchase for your home. With 6500 watts of power, the Honda 6500 Watt Generator will make it possible for you to power multiple appliances at once in the event of a power outage. The generator can also provide 7000 watts of power for 10 seconds if you need it, to start larger equipment. Take some time to think about the most important appliances in your home that you would want to run during a power outage. For example, running your fridge and freezer can preserve your food while running your furnace fan can keep the temperature comfortable. You could also choose to run smaller items like your coffee maker or a hairdryer. Prioritize based on your expected needs and the amount of power each item will use. Having these electronics running will make your power outage experience a more comfortable one for your entire family. Not all generators are able to provide consistent voltage or frequency. In some, when a load is applied, the rpm drops and then has to recover. That type of fluctuation in power can cause the appliances you are running to shut down. It can also cause damage to the generator itself in the long run. Honda has developed an exclusive technology for its generators that avoids the problems inconsistent power can cause. With Honda generators, you get precise regulated voltage and frequency. In a blackout situation, you want to be able to trust that appliances you’re powering will run as expected. You also want to protect the investment you make when you choose to purchase a generator. With the Honda Generator EM6500 and Honda’s exclusive technology, you can do both. Even if a generator works exactly as expected, if the noise level is too high you may find that you never want to use it. A loud generator is unsettling, and it defeats the purpose of helping you and your family feel calmer during a power outage. If you live in close proximity to your neighbors, it may be an annoyance for them as well, which could cause difficulty in your community relationships. Even if you are in a rural area, however, a loud generator will disturb your daily activities. Noise level and quality tend to go hand-in-hand when it comes to generators. The Honda Generator EM6500 runs at a low 73-decibel level, so when it’s running outside your house you’ll barely notice the sound inside. It always best to prepare for a power outage well in advance of the storm or incident that actually causes it. Sometimes, though, you only have a few days to get ready. The Honda EM6500S comes almost fully assembled. Once you receive it, all you’ll have to do is put together the wheels, feet and handles, and your generator will be ready to use. The folding handles also make it easy to transport and store when necessary. A comprehensive and readable owner’s manual also comes with your generator. It’s a great guide to reference instructions or to easily answer any questions. When the lights go dark due to a storm or grid outage, it can be hours before you get electricity again. To pass the time safely and calmly, you want a generator that can last. The Honda EM6500S generator has a fuel capacity of 6.2 gallons and can run for hours. Fully loaded, it will power your electronics for close to seven hours per tankful. Half loaded, it can last more than ten hours per tankful. Knowing that your generator has that kind of capability is reassuring when don’t know exactly when the lights are going to come back on. By prioritizing which electronics you want to power, you can extend their run time to fit your needs. Regardless of its cause, a power outage is an emergency situation, and it’s natural to feel panic take over when everything goes dark. This is especially true when there are children or pets. Purchasing a generator is a smart way to prepare for the situation, but you want to make sure you select on that will be easy to start when you need you it most. The Honda EM6500 is powered by the standard Honda 4-stroke engines which are reliable and easy to start. A recoil backup is also included because if you’re in a situation where you need a generator in the first place, the last thing you want is something that fails on you. When your generator gets low on oil, continuing to run it can be dangerous and can damage your product in the long term. The EM6500 Honda generator comes equipped with the Honda Oil Alert to prevent that from happening. The Honda Oil Alert will detect when your generator is running low on oil and automatically shut the engine off. This protects you and safeguards the investment you made so that your generator can last and run efficiently for years. High-quality generators are worth it when you get excellent product support to go along with it. What’s great about Honda generators is that every Honda Power product comes with Honda’s 3-year warranty. The warranty covers the repair or replacement of any parts that become defective during normal use of the product. It also includes any parts that don’t work as they should due to an issue with the material or the way the product was put together. Because Honda products are so widely used and sold, it is very likely that there is a Honda dealer near you who can conveniently take care of any necessary repairs. In the event that your generator does need to be fixed under warranty, the process should be simple, and you should have your product back in working order quickly. Depending on your need and your budget, you may want to purchase accessories to improve your experience with your generator even more. A number of additional products are available to be used with the Honda EM6500S. Extra purchases are not necessary to get great performance from your generator. But, if you expect to be using your generator a lot or want to make sure you’re storing it properly, product add-ons are nice options to have. Due to its high quality and reliability, the best feature of the Honda EM6500S is the peace of mind it can provide you during a power outage situation. When the lights go out, being able to run appliances makes an uncertain situation feel a little more manageable. Being able to go to the fridge or run the coffee maker can provide normalcy to an otherwise scary situation. Especially if you have younger kids in your house, that can make a significant difference in their feeling of safety. If you have anyone in your household who rely on a medical device that requires electricity, a reliable generator is essential. When so much else is unclear, as it often is in an emergency power outage, being able to rely on a generator is a great feeling. The best-case scenario when purchasing a generator is that you won’t actually have to use it much. No one hopes for a power outage, no matter how prepared you are for the situation. But whether or not you lose power is almost always out of your control. A reliable generator is practical to have in an emergency and as part of any disaster-preparedness plan. The best thing you can do is to prepare for the unexpected, is a Honda 7000W Super Quiet Generator. A generator is an important investment in protecting your safety during a blackout.